Though one should always use an EpiPen that is not expired, it is better to use an expired EpiPen to treat anaphylaxis than to do nothing at all. A few studies published between 2000 and 2017 suggest that epipens have a shelf-life much longer than the printed expiration date. A study published in May 2017 as well as two earlier studies published in April 2015 and May 2000 suggest that even if the epipen is expired, it is still effective and safe for use in severe allergic reactions (anaphylaxis). The May 2000 study examined expired EpiPen auto-injectors 1 to 90 months past the expiration date. What they found was that the older the EpiPen, the less effective it was due to decreased epinephrine bioavailability. The inverse correlation was 0.63 (months past expiration and decreased epinephrine content). The May 2017 study examined the epinephrine concentration of 40 expired EpiPens and found that 29 months after expiration, the pens contained at least 90% of their stated amount of epinephrine. EpiPens 50 months past expiration had more than 84% of the medication. As long as the solution is clear without precipitates or discoloration, it's fine to use expired EpiPens and it'll probably work just fine. Better an expired epipen vs nothing at all... BUT, still better to use an EpiPen that is not expired if given the choice!!! Outdated EpiPen and EpiPen Jr autoinjectors: past their prime? J Allergy Clin Immunol. 2000 May;105(5):1025-30. 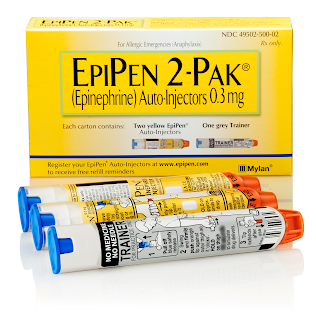 Epinephrine doses contained in outdated epinephrine auto-injectors collected in a Florida allergy practice. Ann Allergy Asthma Immunol. 2015 Apr;114(4):354-356.e1. doi: 10.1016/j.anai.2015.01.015. Epub 2015 Feb 21.